This is what fixed-line broadband competition (or lack thereof) looks like in Minneapolis. 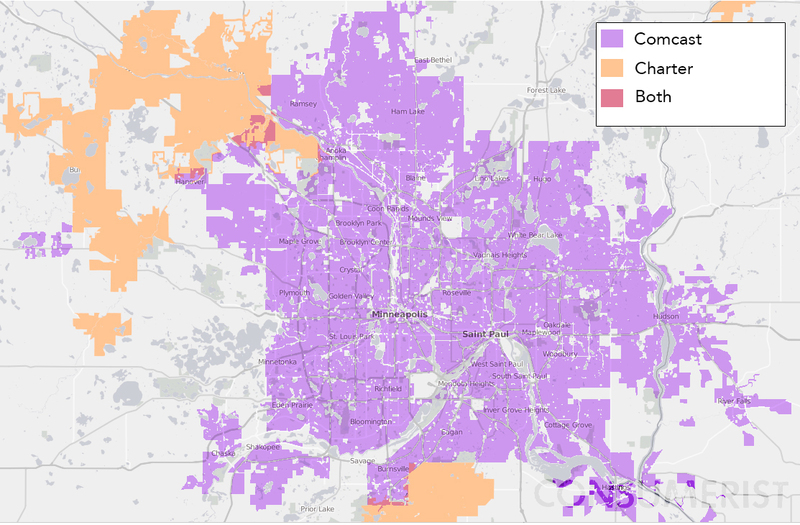 A year ago, when we investigated the sad state of broadband competition in the U.S., Minneapolis was one of the markets we mapped to to show just how few choices people had. As you can see from the map above, the city is almost exclusively Comcast territory, but that may change over the next five years thanks to a recent city council vote. On Friday, Minneapolis city leadership voted to offer CenturyLink the ability to come in and provide a second option for cable and Internet access in the city. Though it could take some time for any real change to occur. The rollout will begin in June, reports the Star Tribune, with the target of 15% availability in two years. The original goal had been double that level of penetration. However, if enough people switch to CenturyLink in the early stages, the company could be required to expand its network. The ultimate goal is for CL service to be available citywide within five years. The company acknowledges that it’s starting from scratch and says it’s going to have to be competitive in order to win customers over. “Because we are coming on the market with zero customers, we’re going to have to do something that’s a compelling financial opportunity for buyers,” a regional VP for CenturyLink said following the council vote. Comcast, which has repeatedly stated that the pay-TV and broadband markets are robust and competitive in the U.S., doesn’t seem thrilled with the news that it will actually have to face competition. Its franchise agreement requires that it make service available to all residents in Minneapolis, and Comcast is upset that this mandate isn’t immediately being slapped on CenturyLink.